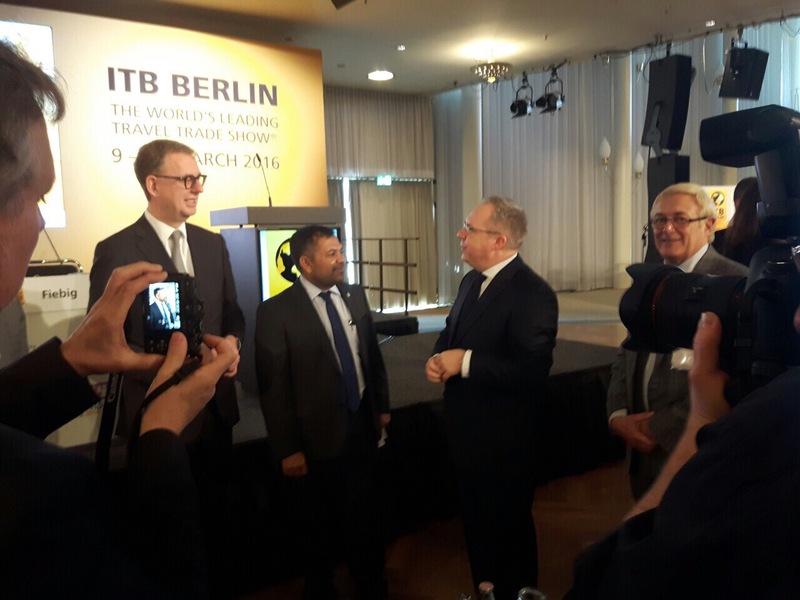 The official press conference of ITB 2016 was held this afternoon, by ITB Berlin at Funkturm Lounge in Messe Berlin, the fair venue. The Minister of Tourism Honorable Moosa Zameer was present in the official panel along with the ITB officials and organizers to riposte any queries by the press about ITB and Maldives being this year’s partner country. Seniors of MMPRC and MOT also participated in this official press conference as Maldivian government officials. Maldives will officially start off the biggest event of the Visit Maldives Year 2016 on 8th March night at the Opening Gala Ceremony of the world’s largest travel trade fair, ITB Berlin 2016. 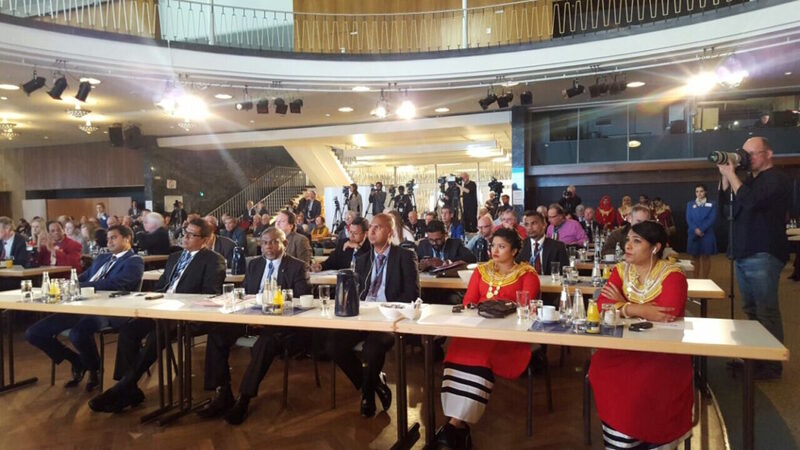 With a total of more than 2,500 invitees attending this special ceremony which marks the 50th anniversary of ITB Berlin, Maldives celebrates being the partner host country of the exhibition. The Maldivian Tourism Minister, Honorable Moosa Zameer will be leading the Maldivian delegation, including ministers, senior government representatives, and industry stakeholders together with MMPRC and Ministry of Tourism. The Gala will feature a special play by 57 talented performers, artists and musicians from Maldives that will be the main event of this special ceremony. The musical dance will focus on the traditions of Maldives, and how development aroused in the small islands of Maldives. A musician will blow a conch shell, thus resembling the start of the performance. The play will be distributed into different traditional and folk Maldivian dances, of which each will have a narration; the general facts about Maldives and the portrayed tradition, activity or custom will be covered likewise in the narration. These dances and performance arts will focus on showing the pride that the nation withholds to have such a diverse existence. The central point of this whole musical of the opening ceremony is on a ‘Dhoni’ (a Maldivian built traditional boat) and its transformation through the years of how it has evolved into the present. An image of a ‘Dhoni’ is also used in the main logo of the ITB Berlin 50th edition, to resemble Maldives being the partner host country, and to add a traditional Maldivian touch to the branding. An exquisite dinner hosted by Maldives, after the opening ceremony will feature different varieties of Maldivian mouthwatering dishes to serve the taste buds of all the opening gala invitees. ITB has been the most prominent fair for the tourism industry for decades, and expects exceptional success this year as well.